Currently, no officially adopted national, state, or local standards exist for CS. Few school systems have begun teaching CS from Pre-K to 12th grade, and the academic research in CS education is quite limited. As such, a cohesive progression of computer science knowledge and skills does not yet exist. We created our own comprehensive and coherent scope and sequence to articulate the full trajectory, from pre-kindergarten to twelfth grade, that will prepare our students for college and career and to guide the selection and development of our curriculum. We plan to continually revise this document and will release an updated version after the K-12 CS framework and revised CSTA K-12 Standards have been released. To develop this scope and sequence, we started with academic research. Much more research exists for CS education at the postsecondary and high school level than for earlier grades. For CS education in grades PK-8, the most significant academic research was conducted by Seymour Papert in the 1970s-80s. His work at the MIT Media Lab led to the creation of the Logo programming language and later inspired the block-based programming language called Scratch. In recent years a few universities, including Harvey Mudd College, Carnegie Mellon University, and the University of California-Santa Barbara, have begun to study early CS education in small-scale NSF-funded research projects. The Computer Science Teachers Association (CSTA) has set a baseline for what to teach in the early grades, with its K-12 standards. These standards distinguish five complementary strands to CS education. While these standards provide great guidance, they are both too vast and insufficiently fine-grained, and thus, are not immediately implementable. 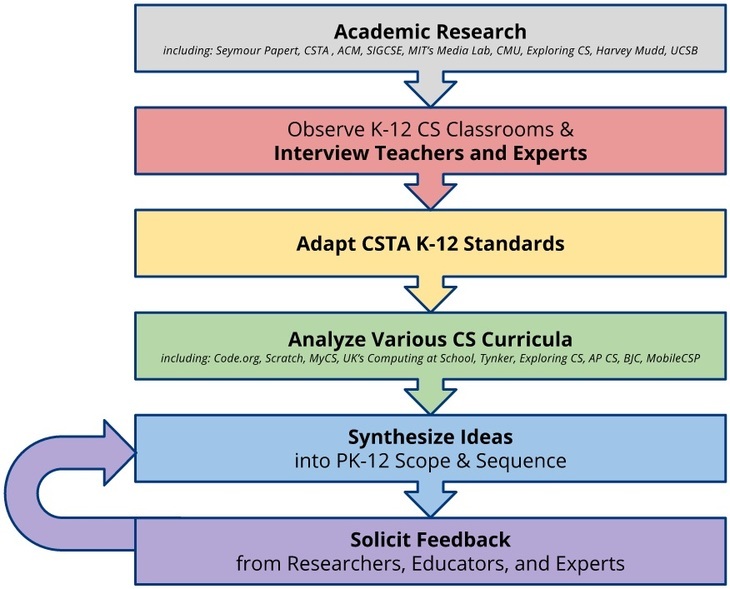 We used the five strands of the CSTA K-12 standards as the framework for our scope and sequence. We built upon this framework with knowledge gained through research, classroom observations, and teacher and expert interviews. We also analyzed the majority of existing K-12 CS curricula and looked for commonalities among sequencing, priority, and appropriate grade level placement for particular knowledge and skills. 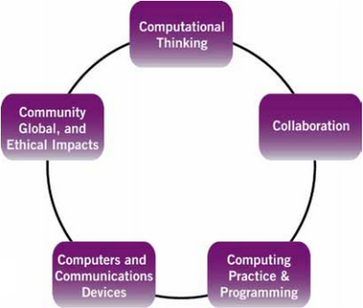 These curricula included: Scratch Jr., Creative Computing, Scratch, Thinkersmith, Kodable, Tynker, Hopscotch, Code.org, MyCS, CS Unplugged, Girls Who Code, the UK’s Computing at School, Exploring Computer Science, Mobile CSP, the Beauty and Joy of Computing, and the AP Computer Science A framework. We synthesized the most important ideas into grade level band ranges and then solicited feedback from a variety of researchers, educators, and other experts. These included: high school CS teachers, middle school CS and STEM/STEAM elective teachers, the local CSTA Golden Gate chapter and other CS teachers, researchers, professors, and curriculum developers.